Homelessness may not seem like something that happens in northern Cook County, but it does. Meet a group that’s there to help area homeless to navigate a challenging time in life. 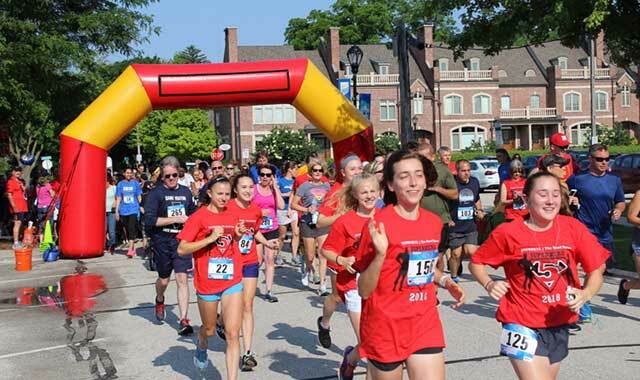 The Superhero 5K Run/Walk event each June is a major fundraiser for Journeys | The Road Home. This year’s event netted nearly $20,000 for services to help the homeless. “Tamara” is a hard-working, single mom making ends meet for her and her little boy. The two were living in a small apartment in Cook County where the cost of living is 15 percent higher than the rest of the country. Recently, a gas leak was discovered in their building, and just like that, they were homeless. Thankfully, they found Journeys | The Road Home, in Palatine. Committed to ending homelessness, Journeys is the only provider serving the north and northwest suburbs of Cook County that offers both shelter and social services to the homeless and near-homeless. The organization operates the well-known PADS program, which encompasses 21 faith-based sites that provide overnight shelter including dinner, breakfast and a sack lunch. Journeys also provides supportive services through its HOPE Center. Tamara and “Lucas” used the shelter sites daily for a month and a half, until they could get back on their feet. “Here’s a woman who didn’t have nearby family members to stay with, and the gas leak was no fault of her own,” explains Suzanne Ploger, director of development. “She said the proudest part of her whole experience was that it had no effect on her son’s schoolwork. They’d go to the shelters, sit down, have their dinner, he would work on his homework and she would work on hers.” Tamara was in a certification program she was trying to finish. PADS was born 40 years ago when local churches wanted to respond to the needs of the homeless. “Many of the original churches continue to exist as PADS sites,” Ploger says. Two years after PADS was born, Hope Now was established to provide counseling, a food pantry, case management and more. The two agencies merged in 1999 to form what is now Journeys | The Road Home. It doesn’t take much for that to happen. “A medical issue, a divorce, a job loss – one little hiccup and suddenly they’re having trouble paying their mortgage,” Ploger says. PADS is staffed by more than 2,500 volunteers, but more are always needed, especially for overnight shifts at the sites. About 70 clients are served each night. Journeys always welcomes donated items that can help those who stay at a PADS site. For the past two years, PADS has also operated during the summer, and growth has been rising ever since. “The ultimate goal is having multiple sites every single night, like we do with our winter program,” Ploger says. At 1140 E. Northwest Highway in Palatine, Journeys operates its administrative offices and HOPE Center. Any person in need can come in the door and receive services, so long as their current or most recent address was in the north or northwest suburban area of Cook County – a territory stretching roughly from Barrington to the North Shore, and as far south as Bartlett and Chicago city limits. Clients check in at an intake counter staffed by volunteers. Here, they register for emergency shelter, receive mail and, if needed, schedule an appointment to see a case manager. On the opposite side of the building, offices are staffed by case managers and other professionals who help clients with their mental health, vocational, housing, health care and legal needs. Food is served, too. Journeys receives many one-time donations from area restaurants and banquet facilities. “We get food from Starbucks and Panera all the time,” Labedz says, while opening a large freezer stocked with individual pizzas from Lou Malnati’s. An adjacent area provides showers and a mini-laundromat. A plentiful supply of travel-size shampoos and soaps nearby is available for the taking. Just around the corner is an ample clothing closet and food pantry. Clients can share a meal, read a book, talk with and encourage one another. It’s a safe, warm place to stay during the day before PADS shelters open at night. A free bus will help them travel there when the time comes. A handful of professionals visit clients weekly to provide haircuts, bicycle repair and health care. Journeys case managers are experts in all of the benefits programs available to veterans and mental health clients. The intake process is about an hour long. Myriad issues plague the homeless. They may have experienced domestic violence, substance addiction or a job loss. They may be disabled or down on their luck. A house fire or flood may have forced them from home. The staff spends time talking with each person, treating them with respect and identifying individual needs. They can arrange for transitional housing or get them established in an apartment. An Amazon wish list was launched recently to address ever-growing needs. Journeys doesn’t receive federal or state funding. It relies on support from corporations, foundations, school groups, Rotary clubs and individuals. Recently, Keller Williams Realty donated funds and reorganized the clothing and food pantries. They also surprised clients with boxed lunches and beautified the entrance with flowers. Allstate Insurance collected more than 2,000 pairs of socks, while the Palatine Library provided a cart of free books. Miss Teen Illinois 2018, Sydni Dion Bennett, collected more than 600 pads and tampons. Three fundraisers further support Journeys. The Bid for HOPE gala happens every year around early November. The event features a live auction, a raffle, wine pull and paddle raise. About 200 supporters attend the event each year; they donated nearly $160,000 in 2017. The Garden of Giving Women’s Luncheon, held each April, is attended by close to 200 women and children and raises about $30,000. A Superhero 5K Run/Walk held each June is hosted by the organization’s Young Professionals Board. This year, the event raised $20,000. This year, Palatine resident Tavares Chambliss, the “Neon Ninja” whose appearances on television’s “American Ninja Warrior” springboarded him into the spotlight, served as mascot. More than 330 people attended on a 90-degree day. In a given year, Journeys serves around 1,000 people. Demand continues to go up, but staff remain encouraged by the outpouring of support. Donations are always welcomed. They can be made securely online at journeystheroadhome.org, by mail, or by phone. Call (847) 963-9163, ext. 116, to inquire about volunteering, hosting a clothing or food drive, or dropping off items for donation. This entry was posted on Wednesday, November 21st, 2018 at 12:00 pm	and is filed under Mind & Spirit, Top Posts. You can follow any responses to this entry through the RSS 2.0 feed. Both comments and pings are currently closed.